First, the poll. I see that I currently have 15 votes, so either my three visitors are voting frequently, or else I have over a dozen readers! The vote is currently split equally three ways, 1/3 is dunno, 1/3 is yes, 1/3 is OMG Yes! Today's the day ladysolly has her evening bridge class. She's become a Bridge Fiend, and she's accumulating Monster Points and playing rubber, Chicago, pairs and going to classes. Which meant that today, I have a Late Pass. I looked at the weather - it looked like everywhere would be rainy, but Southampton least so. I found a handy layby, parked tidily, and spent 20 minutes finding the first micro. Then I got on the bike, and the rest of the day was similar - a lot of difficult caches, including a fun tree climb. I spent several hours in Victoria Royal Park, at the same time as a few dozen police, who were having some sort of training exercise. I expect they got a bit fed up with the same bike rider riding through their riot control practice again and again, but it is a public area, and I did ask them, and they did say it was OK. I didn't take a picture, though, because I know how shy they are about photography. This isn't the first time I've been round here; I recognised many of the locations. Same place, new cache. Here's two things I saw there. 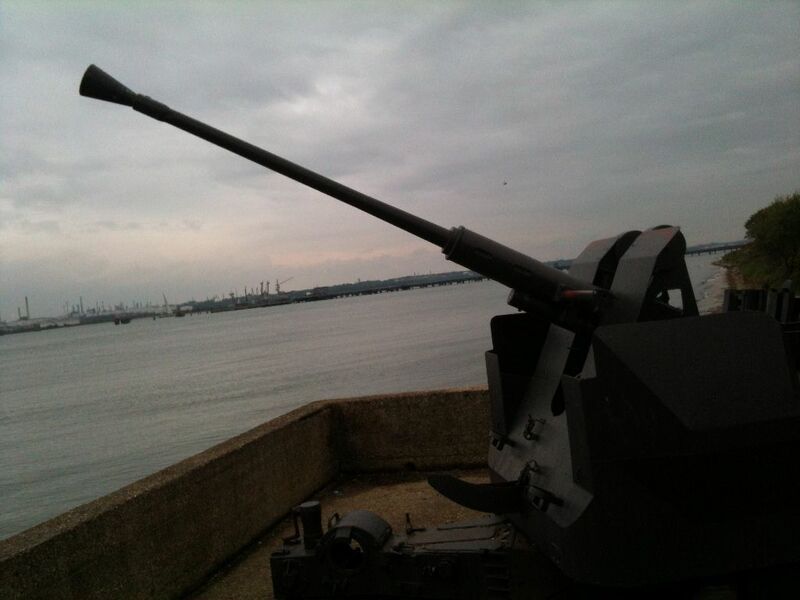 The first is a WW2 anti-aircraft gun. There were lots of fortifications around here, it was an obvious invasion possibility, plus it's where the Spitfire was developed. A container ship - they always look overloaded to me, piked high with boxes, but I expect they know what they're doing. 38 caches found today, a couple of DNFs, and two I bottled out of because they were too high up in a tree, and I'm not that good at climbing, although I'm absolutely olympic standard at falling.